Trawling is one of the most harmful fishing methods. Enormous nets as wide as a football field are dragged through the water or across the seafloor, capturing almost everything in their path while damaging vulnerable habitat. Every year, trawlers around the world drag nets over an average of six million square miles, impacting an area equivalent to twice the size of the entire U.S. Most fish that are targeted by trawls can be fished using other, more selective methods. Avoid bycatch using real-time reporting across fishing fleets. Minimize injury and deaths by using Turtle Excluder Devices (TEDs) in all trawls. Longline fishermen use lines that can extend for up to 50 miles, with thousands of baited hooks branching off from the main line. Unfortunately, the baited hooks attract a vast array of species that are not intentionally targeted, including diving birds. If an animal becomes hooked, it is often seriously injured or dead by the time the gear is retrieved. Using more selective gear instead of longlines is proven to reduce bycatch and improve fishing efficiency. Transition to cleaner, more selective fishing methods and develop more incentives to reduce bycatch. Assign enough observers to accurately and precisely estimate bycatch. 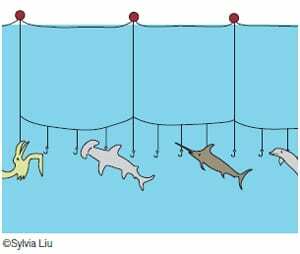 Gillnets are walls of netting that drift (“drift” gillnets) or are anchored (“set” gillnets) in the water, designed so that fish get stuck around their gills when they try to swim through. The netting can be up to two miles long and anchored hundreds of feet deep or left floating at the surface. Though researchers work to develop ways of reducing entanglement in gillnets, this gear has been banned on the high seas by the United Nations, as well as by many other countries. Eventually ban the use of drift gillnets in the U.S. 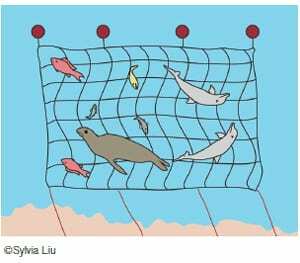 In the meantime, avoid setting nets in bycatch hotspots and limit the amount of time nets can remain in the water before being retrieved.